I think they should rent kayaks for the ESP reflection pools. Back when I had an office in Albany, I was seriously considering plopping my kayak in pools for a lunchtime paddle. There are signs that list a bunch of prohibited activities, like: no wading, fishing, swimming, diving, etc. But nowhere does it prohibit kayaking. I think it'd be a blast to paddle around the Alexander Calder sculpture in the southern pool. And it would be very lively and colorful to see all the kayaks out there. And hey, if the lifeguard gets to row a boat in the Lincoln Park Pool, we should be able to kayak at ESP. Cool! Even cooler would be to put down some field turf, fences, and lights and open it up for pick-up (and league) soccer a la Pier 40 in Manhattan. Couldn't help but imagine that when I saw your rendering. I'd picnic that. Bring a kite. Fireworks don't reflect well off grass. Replacing the reflecting pools with a grass lawn? Wow. What a horrible idea. The pool is somewhat unique. It blends in with all the marble and buildings on the plaza, catches your eye, and in the dog days of summer even provides a nice breeze/spritz. A random grassy lawn would have none of those attributes. Also it's not like there's a lack of lawns to picnic in around there. As soon as the trucks come back the Capitol Park facing the Smith Building (and to a much quieter extent on the side facing down State Street) is packed with people enjoying a lunch on lawns, benches and steps. Although the beating those lawns take suggests OGS would have their hands full keeping an ESP lawn presentable. One plot of grass does not a mall make. I don't think the small area would be able to handle the foot traffic, especially at events like fireworks and concerts. Without special attention, this could fast become a mud bowl. Further, the present design supports the buildings and hardscape aesthetic. 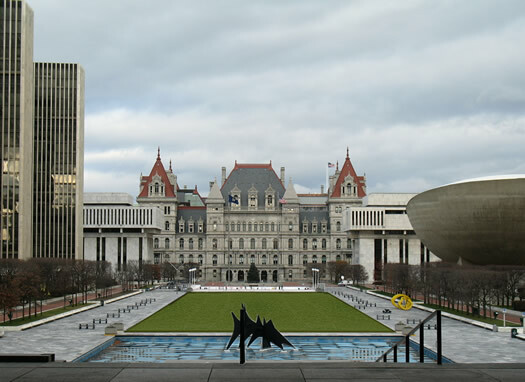 If Albany wants soft and fuzzy, look at areas adjacent to the ESP to create that vibe. Don't mess with the present design. I've always found those reflective pools to be a little creepy. The could fill it with sand like Paris Plages. More fun than you can handle? Possibly. I agree with ace, a large grassy area would not look great next to the surrounding hardscape and overall modernist look of the plaza. And it would absolutely become a muddy wreck after large events. Interesting that most people here are against this idea. I think that the juxtaposition of green grass would be beautiful there. Or anything that would be interactive, rather than a large pool of water. In my opinion it makes the plaza more of a place to walk through rather than stay in and enjoy. As a soccer & ultimate player living on lower Madison, I love the idea of some green space at the plaza. But as others have said, it would get so much use and traffic it would be extremely difficult to maintain it. Field turf would make more sense. Though I hate turf, I would still begrudgingly use it. A lot. Maybe having a block for relaxing & picnicking, and fencing in another area for recreation would reduce "shortcut" foot traffic and make it more sustainable with grass. The pools are cool in an art/architecture way but don't really serve any other purpose, just there for looking at. Recapturing that much space for recreation would be neat and bring some life to a cold stone complex.